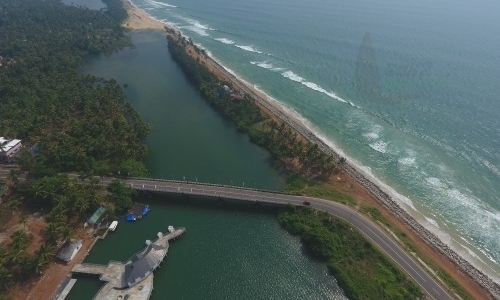 Varkala Beach is one of the major tourist spot in Kerala, is a calm and peaceful place gifted with immense of natural beauty. It is the only place in southern Kerala where palm-covered red cliffs are found adjacent to the Arabian Sea which makes Foreigners more attracted to Kerala. The view of beach and aside from Cliff along the sunset makes our mind and atmosphere astonishing.The ancient Janardanaswamy Temple dedicated to Lord Vishnu is located on one of the hill-tops near to varkala beach.It is one of the major pilgrim spot in varkala.Varkala is popular for Papanasam Beach, it is believed that taking bath here washes away all the sins in one's life. The Samadhi of Kerala's Saint Sree Narayana Guru is located in this town and hence has become a place of pilgrimage.Varkala beach and Cliff holds best to spend an evening to relax and rejuvenate.